No one really wants to join one more social network, still they keep coming. 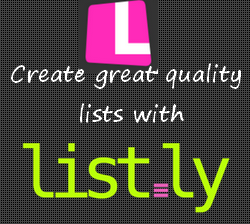 But I am sure List.ly is a completely new and a productive way of creating lists and social integration is a requirement of the idea to make those lists more comprehensive and excellent quality. Everyone has lists of anything and the topic of the list could be anything. It may be a great classic songs, best Android applications, best software for windows, alternatives to google reader or something that you may think of. Listly offer you a platform to create a high-quality list with the help of other network members. You just start the topic and people will keep adding the related items. The quality of the list is controlled by the upvotes and downvotes for any particular item in the list and the ranking of that item in the list will be determined by the number of upvotes. This makes the list more and more qualitative. You can sing up for as a free member with your Twitter of Facebook account credentials and start creating either your own list of any topic or follow the already trending lists. You can also add an item to the already created list of anyone making the list more comprehensive but the rank of that item will be determined by the voters. The items in any particular list can then be shared to other social networks, saved for future use to your personal account and you can add your own comment to any item. 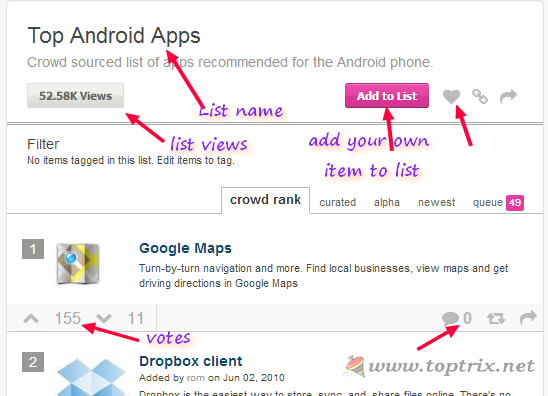 Now you don't have to search any website or ask anyone for the best of the list. Just head over to List.ly and get best out of the category. I am sure you will find the social integration a productive way.